How and Where to Buy Latuda Online? Need to fill your prescription to Latuda? Why not do it right here at www.CanadianPharmacyWorld.com? As long as you have a valid prescription, the process is a breeze. And if you need to talk with someone about the medication, or your order, you can always dial 1-866-485-7979. One of our pharmacy technicians would be happy to assist you. For more information on our pharmacy, please click on About Us. Are there Alternative Names for the Brand and Generic Latuda? Latuda is the brand name drug and the generic equivalent is called lurasidone. What Dosages and Forms is Latuda available in? 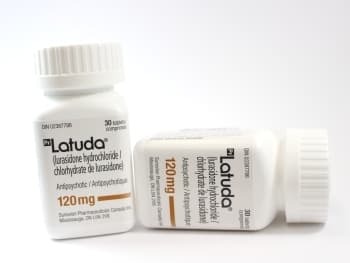 Canadian Pharmacy World only carries the brand name Latuda at this time. The medications come in a variety of dosages and quantities including: 20 mg, 40 mg, 60 mg, 80 mg, and 120 mg. The medication comes from Canada and it is manufactured by Sunovion Pharmaceuticals Inc.
What is Latuda used for? Latuda is an antipsychotic medication used for treating schizophrenia in adults and children over 13 years old. It can also be used to treat depressive episodes in patients suffering from bipolar disorder. Latuda works by restoring balance to certain chemicals in the brain. In doing so, it helps patients to think more clearly, feel less nervous, and even decrease hallucinations. What are the Possible Side Effects of Latuda? Most medications will come with side effects. Before deciding if Latuda is right for you, take a closer look at what you might expect. Are there any Precautions and Drug interactions of Latuda? Store Latuda at room temperature away from extreme heat and moisture. Latuda is not approved for the psychotic treatment of conditions related to dementia, and it may increase the risk of death in older adults with these conditions. Report any new or worsening symptoms to your doctor, including mood or behavior changes, panic attacks, anxiety, insomnia, impulsivity, irritability, agitation, aggressiveness, hyperactivity, increased depression, suicidal thoughts, etc. Avoid grapefruits and grapefruit juice while taking Latuda, as it may have unwanted side effects. Stay clear of products which contain grapefruit extract or oils, such as lotions, etc. Avoid drinking alcohol while on this medication, as the side effects could be extremely dangerous. This medication may cause problems in a newborn, if taken during the last trimester of pregnancy. Be sure to talk with your doctor right away if you become pregnant while on this medication – or if you are pregnant before you start. This medication can impair your thinking and/or reactions. Be cautious when driving a vehicle or when getting up too quickly, as you may get dizzy. Drink plenty of water to avoid dehydration while you’re on Latuda, especially on hot days or during intense exercise. Latuda is not approved for anyone younger than 13 years old, when treating schizophrenia, and it’s not approved for anyone younger than 18 years old to treat depression. Latuda is not approved for anyone younger than 18 years old. Keep out of the reach of children.